The first step in creating a junk journal, once you have your supplies ready, is to create your junk journal signatures. This can seem confusing at first, but I promise its easy once you’ve gotten the hang of it. Plus, creating the signatures for your junk journal is one of the most creative parts of the process. You can mix and match colors, tell a story with your patterns, and create space for journaling and photos. In bookbinding or journal crafting, a signature is a set of pages nested inside one another the creates one small section of the book. Each signature is usually 4 to 7 pages in total, and is individually stitched into the book. Each journal is made up of many signatures stitched into the book together. To create signatures, you’ll need paper. There are lots of different kinds of paper out there – and almost any is a good choice for a junk journal You can use junk mail, scrapbook paper, old book pages or even computer paper. If you need more guidance, we’ve got an entire post on junk journal supplies for beginners to help give you some ideas of what to start with. I like to use a variety of scrapbook paper, kraft paper, cardstock and tea dyed paper typically – which is exactly what I did for this junk journal. You’ll want about 10 to 20 pieces of paper Which cut down will get you 20 to 40 pieces, and folded will have you at 80 to 160 pages, to get you started. You can add or subtract as you go, but I’ve found this is a good starting place. Before you can begin measuring your signatures, you want to decide how large you want your book to be. In this instance, I decided to create a book that was 6 inches tall by 4 ½ inches wide. To create my signatures, I started with a piece of scrapbook paper. I find that using scrapbook paper which is a little bit heavier and often has a pretty pattern creates a great outer page for your signature. You don’t have to do this, but it might help for your first try, especially when we get to stitching the junk journal together. 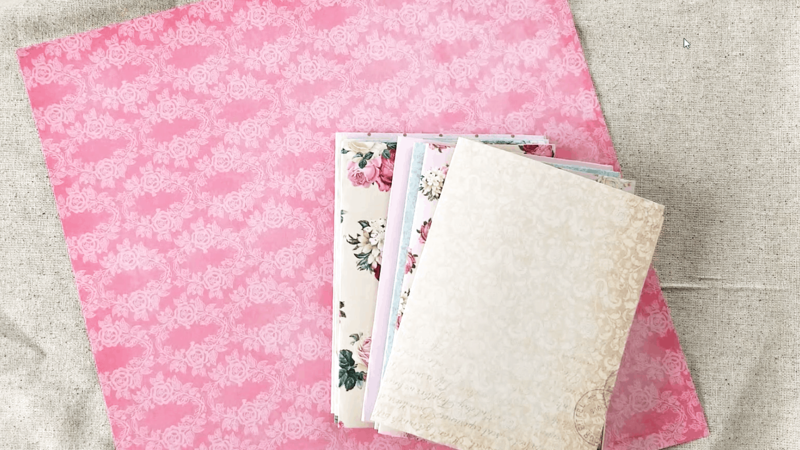 Your average scrapbook paper is 12×12 inches so you can cut that piece of paper in half and you’ll have two 12×6 inch pieces of paper. You could then cut them down again by trimming 3 inches off of the 12 inch side of the piece of paper. Personally, I like the flaps created when I fold the paper over and leave them. They can easily be turned into tuck spots as well as places where you create fold outs and flip ups. So I leave them on – but feel free to remove them if they bother you. You’ll then want to fold your paper over, making sure you create a nice neat fold line. If you’re working with thicker paper, I recommend getting a bone folder. It’s useful for a lot of different things, and I find it frequently comes in handy. Keep doing this over and over again until you’ve folded up all the paper you have. By now you should have a few piles of different kinds of paper. Now you can start assembling your signatures. Pick up several pages and start nesting them inside one another. Remembering that you want between 4 and 7 pages per signature. Ideally you want all your signatures to be roughly the same size. Again, this helps with stitching the junk journal, as you’ll have evenly sized signatures to work with. You can always experiment with this later, but when you’re learning I recommend keeping it as easy on yourself as possible. Then stack all of your signatures on top of one another and see if you have the amount you’d like for your book. You can add or subtract at this point based on how big you’d like your first junk journal to be. Next up, you’ll want to make the junk journal cover.